Hauskaa lauantaita, tervetuloa viikon Allsorts haasteen pariin! "Kesän inspiroimia" askartelutuotteita halutaan nähdä tällä viikolla. Upeita purjeveneitä nähdään Päijänne purjehduksella, tuo vähän säpinää tänne mökkipaikkakunnallekin. Hi; Happy Saturday, it's time for a new Allsorts Challenge! "Inspired by Summer" is Tracy's theme this week. dots embossing folder, 3d dots. Ihana ja rauhallinen merellinen tunnelma - tykkään! Very pretty card - love the image!!! Thanks for joining us at Ooh La La Creations!! 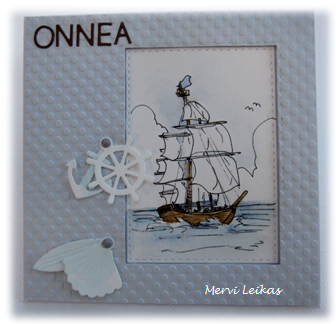 Super nautical scene you've created on your card. Thanks for sharing at The Male Room. 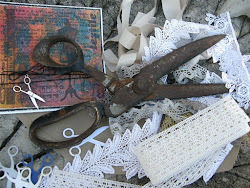 This is a fabulous nautical creation, I love the image you’ve used. Ah, love this nautical look with soft colors and die cut details! It's a design that fits a man or woman equally. Lovely card. Super image and I do like the texture too. Sorry I'm so late commenting, thanks for playing along with The Male Room's Vacation/Beach challenge!